Anyone who knows me knows that fly fishing for Brown Trout in small streams is my favourite thing to do. The challenges presented, the constant change in conditions and the surprise of large fish in small waters draws me back time and again. Every trip is a new adventure, sometimes spectacular, many times not, that's the allure to me. There are few things that I have learned along the way that may help you with your pursuit of Brown Trout in small streams. Equipment: Your choice of equipment can be just as important as how, when and where you fish, the right tool for the right job goes a long way to ensuring success. A shorter rod than the usual 9 foot will make it easier on creeks and streams that have heavy streamside vegetation to deal with. Casts will not be long so a shorter medium action rod in a lighter line weight, 2, 3 or 4 weight, will work well. Tthere is no need for the extra length or power that a longer rod has. Accuracy is much more important than distance when fishing small streams. Your line should also be dull in colour, the bright orange or yellow ones are fine for big water but on these smaller streams your line will probably spook the trout, both in the air and on the water. There are lots of lines out there that the first section or even the whole Flyline are duller in colour, tan or dull olive etc. A shorter leader can also be an advantage, 12 or 15 ft. leaders are just asking for trouble so stick with 9 or even 7 foot leaders with a foot or so of the appropriate tippet. Flies: Much of a Brown Trout’s diet in small streams is going to be terrestrials, ants, beetles and hoppers and such is the diet that makes up a large part of any Trout in a small stream. Small streams tend not to have the insect populations and hatches of aquatic insects that larger streams and rivers have. Trout must therefore depend on a broader range of food sources including terrestrial insects, mice, and anything else that gets into the water that they can get there mouth around. Nymphing can be tough on small streams unless you are willing to by-pass some good water and constantly adjust the depth on your strike indicator, and also be willing to lose some flies. 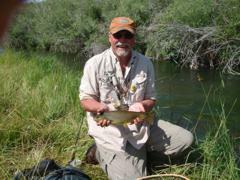 Many of the streams I fish range from a foot to 10 feet deep, and everything in between, all within 30 yards of stream. If I want to fish a nymph, when no fish are rising, I'll use a dry-dropper rig, but hang the nymph very close, a foot or so, under the dry. Streamers will also work but if you are working downstream be sure to stay on the bank and keep as low as possible. Approach: Small stream fly fishing requires the angler to use a stealthy upstream approach, you are basically stalking the trout. While trout face into the current in most situation there are many times, especially on slower moving streams and creeks the trout will circle when on the feed and an angler standing on the bank is sure to spook the fish. Anglers should be aware that many things they do on larger streams will spook trout in small streams, especially Brown Trout which is considered the most wary of all of them. Whenever possible approach from downstream, fishing upstream. This does a couple of things, firstly you won’t be mudding the water causing silt and weeds to travel down to the trout , this will almost always put them down. Approaching from below the trout also puts you in its’ blind spot, trout always face into the current, this is how they breathe, water in through the mouth and out through the gills and also how they feed, letting the current bring the food to them. Always try to position yourself to make the easiest cast possible without spooking the fish, quite often changing your position or angle can turn a tough cast to a difficult lie much easier. Also be careful when walking the bank, undercuts on some streams can go quite far under and walking on them will spook any trout hiding under them, these spooked fish will often spook any other trout in the vicinity. Don't be afraid to rest a pool or good looking lie, sit observe and wait, it can be tough to do but it will often pay off with success. Lots of places to hide! Structure and location: All trout look for shelter from above because that is where much of their danger comes from, these lies are called sheltering lies and can be log jams, undercut banks, overhead bushes or even deep pools, anything that makes it harder for birds to get to them. When you get a current line or seam that runs along one of these obstacles, such as the current running along a log in a logjam you have a prime lie, where a trout can have both overhead cover and food supplied by the current. These prime lies are where you’ll find the biggest fish. Once you find these you are sure to find a good fish as they always will be occupied by a good fish. When approaching a good looking spot, especially pools, always make a few casts to the tail-out and the sides, these areas will often hold what we call sentry trout, if you start by casting right into the meat of the pool you will often spook these smaller fish. Once startled these fish will often spook right into the pool and alert any other fish present that something's up. It's always better to hook these smaller fish and get them in quickly and release them as they will head for the closest cover, leaving the pool undisturbed. One of the big advantages of small stream Brown Trout fishing is that browns are very territorial and will "stay put", once you know where they hang out they will always be there, so you can catch them, or at least fish to them, every chance you get. Stay low and out of the water as much as possible. Casts and presentations: If there is one cast that many angler don't use enough it's the roll cast. When using this cast the line doesn't go behind the angler eliminating encounters with streamside vegetation and lost flies. This cast once mastered can eliminate false casting which can put your fly line over top of the trout and spook them. If you are using a regular overhand cast try to make your false casts off to the side of your target, this will eliminate putting your line over top of the fish and also throwing spray over the target area. Anything you can do to not spook the fish is to your advantage. The one advantage to using terrestrials is that they often hit the water with a splash, and once they are there they struggle like mad, they are not happy to be there. As an angler this allows you to get away with less than perfect presentations and drifts. Small streams don't necessarily mean small fish, browns can grow surprisingly large in these waters, but they get that way by being very wary. Slow down, use stealth, accurate cast and you should be able to outwit one of these beautiful fish. The size of fish small streams can grow is often suprising.